But what makes us different? As a non-profit, partnership organisation of both NHS and academic partners, we are embedded within the healthcare system and so are uniquely placed to effect change within it. 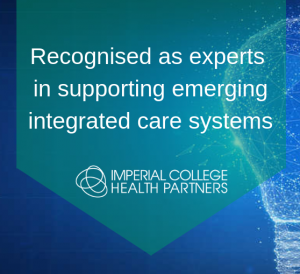 We also work with national and international experts in this area, with a strong track record of delivering capability programmes and supporting emerging Integrated Care Systems. And we have in-house analytics expertise which has already been recognised and endorsed by bodies such as Public Health England, NHS England, NHS Improvement, NHS RightCare and many more. Over the last 12 months we have worked closely with local health and social care providers in Harrow to start creating an integrated health system that enables people to live independent, active and healthy lives. We provided guidance and support in setting up the governance structure for the integrated system and, once the governance was in place, we also provided analytics expertise to drive service redesign in the area and enable sustainable change. This analysis helped to inform the shape of the programme, and Harrow broadened their initial focus to healthy people over 65 as well as those requiring health and care interventions. And we delivered coaching and capability programmes for hundreds of senior and frontline staff within the system, ensuring staff felt enabled to take forward the new way of working. Based on the outcomes of the successful first phase, our commissioners in Harrow have now re-commissioned us to continue working with them over the next 12 months, and we continue to be embedded within the programme, supporting them to become a mature integrated system – an exciting opportunity for growth and learning for all involved. We have also carried out similar work in Hampshire, working to help establish an integrated care system there, working as part of a consortium of partners. In particular, we looked at whether lessons from delivering integrated care in Germany could be brought across to the NHS. As part of the work we were able to identify overuse, misuse and underuse of care by entire segments of the population, and work with front line staff to plan how these issues could be proactively tackled. Do get in touch if you would like to find out more information about our integrated care work, or how ICHP could help you solve your healthcare challenge.